Another post-Butterfly day has passed. It's taking a while to return to normal after what seems according to most people to have been a major triumph. Last night, my breathing problems seem to have come back in a big way, and I woke up three times, each time with a different nightmare lingering in the memory. Two of these dreams involved science fiction personalities with whom I haven't spoken in a decade: in one of them, I was frantically editing a novella by Beth Meacham (who was actually my editor back in the 80s) while in another, Harlan Ellison was trying to force-feed me a Caesar salad that was covered in huge mounds of extremely dry garlic. The other nightmare is perhaps more comprehensible. I enter a wooden room. It's a house on stilts, a big rectangular room with a side entry to some kind of covered veranda or music room (this is I think, the exact same house as in my dream of 25 years ago about the woman in red and the ape, but more of that later). As in that previous dream, I have escaped from something and I'm hiding in the house. Carefully I seal off the veranda room and lock the front doors. The back is a sliding glass door, or a French door, that overlooks some kind of jungle or dense foliage sort of landscape. Ascertaining that I am perfectly safe, I sit back on the sofa. Suddenly, a huge, feather-headband-sporting native American bursts through the glass door -- which has never been closed at all -- brandishing a weapon which is a huge staff made of green sugar cane (or bamboo!) So, this creature chases me to the bed, wildly waving the sugar cane. Is this scary or what? Now this week, I have to turn my thoughts to my own physical survival, having let myself get torn apart a bit over the opera. 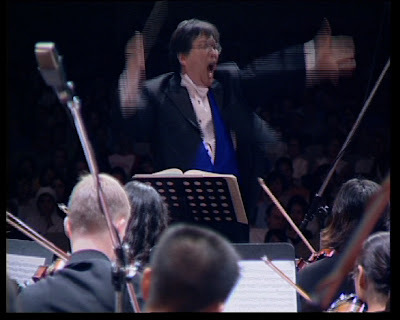 But the odd thing is, I didn't really feel sick during the opera, even with occasionally conducting for nine hours. Maybe I don't really need to be attached to breathing machines ... I just need to be working on real creative stuff ... who knows?